The US Track & Field/Cross Country Coaches Association (USTFCCCA) released their 2016 Outdoor Regional Awards earlier today. Penn and Cornell men each claimed three awards within their respective regions (Mid-Atlantic and Northeast), while #13 Harvard swept the awards for the women’s Northeast region. Quite a dominating performance for the Ivy Leaguers. Penn’s Thomas Awad repeated as the Mid-Atlantic Male Track Athlete of the Year due to his strong anchor leg at the 2016 Penn Relays 4xMile Championship of America, where he led his Quaker team to victory with a spectacular come-from-behind finish in the final 150m of the race, and for being one of the top 5,000m runners on the East Coast and qualifying for the USATF Olympic Trials in the 1,500m. This time, Sam Mattis and Assistant Coach Tony Tenisci join Awad in receiving regional honors. Mattis was pretty much a “no-brainer” of a selection for the Mid-Atlantic Male Field Athlete of the Year as he set a new American Collegiate Record (and new Ivy League record) in the discus throw in his first competition of the 2016 season, but USTFCCCA also recognized Mattis’ first ever four-peat in Heps titles in this event. Mattis enters NCAAs as the defending discus champion and a Bowerman’s Award contender as he has been included on the award watch-list all season long. Coach Tenisci was honored as the Mid-Atlantic Men’s Assistant Coach of the Year for coaching Mattis to this new record, as well as developing the Penn throwing program to being one of the best on the East Coast. What an honor to receive in his final season as a coach. Adrian Durant was honored as the Northeast Men’s Head Coach of the Year in his first year as the Cornell head coach, as he coached the Big Red to the Outdoor Heps title with the highest team score in conference history – 211 – behind 11 event wins. Durant is joined by assistant coach Zeb Lang in receiving Northeast coaching honors as USTFCCCA recognized Lang as the Northeast Men’s Assistant Coach of the Year. Lang coaches the mid- and long-distance athletes, including the Outdoor Heps Track MVP Ben Rainero (winner of both the 10km and 5km). Cornell will be sending five athletes to the NCAA finals later this weekend, including the Northeast Male Field Athlete of the Year – Rudy Winkler. Winkler is one of the top hammer throwers in the nation and is looking for his second straight First-Team All-American honor in this event. Like Awad, Nikki Okwelogu is a repeat honoree as she “defends” her Northeast Female Field Athlete of the Year honor. 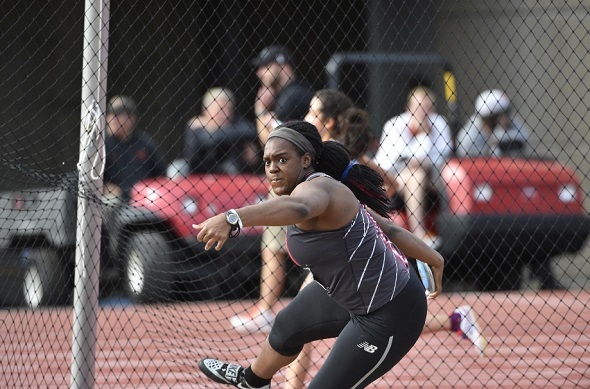 Okwelogu defended her Outdoor Heps shot put and discus titles – earning the Outdoor Heps Female Field MVP honor – and will be going to NCAAs in both events. Autumne Franklin‘s outstanding senior season continues as she was tapped as the Northeast Female Track Athlete of the Year. Franklin was a part of three new conference records this season – 400m hurdles, 4×100 relay, and 4×400 relay – and was a four-time champion in the 100m hurdles. Franklin will be off to NCAAs in three events. Harvard’s coaches Jason Saretsky and Kebba Tolbert were awarded the Northeast Women’s Head and Assistant Coaches of the Year, respectively, for coaching the Crimson women to their third straight Outdoor Heps team title, eight new conference records, and for reaching a conference-record high national ranking of #10 back at the end of April. Saretsky also won this award last year. This entry was posted on Monday, June 6th, 2016 at 8:55 pm. It is filed under Athletes, Spotlight. You can follow any responses to this entry through the RSS 2.0 feed.